Located in historical and coastal St. Augustine, Florida, the St. Augustine Alligator Farm offers visitors a memorable experience involving some of the state’s most recognizable wildlife. One of Florida’s oldest attractions, the farm was founded in 1893 by George Reddington and Felix Fire. The accredited zoological park has been expanding regularly ever since, periodically adding fun new family attractions. Planning a visit to the St. Augustine Alligator Farm? In addition to many different types of alligators and crocodiles featured in a variety of natural environments, the St. Augustine Alligator Farm also offers exhibits that include giant tortoises, birds of Africa, exotic birds and mammals, Komodo dragons, and a koi pond just to name a few of the major attractions in the park. One of the most poplar attractions is Maximo, the largest crocodile in the park – a saltwater crocodile native to Australia. Daily wildlife shows add an extra, educational dimension to park visits for animal enthusiasts, students, and young children. The park is also involved in conservation efforts. everything the alligator farm has to offer. A gift shop and snack bar are also available to facilitate the most enjoyable experience possible. 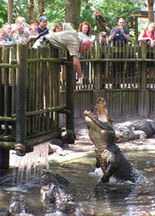 Visitors can purchase tickets online for St. Augustine Alligator Farm here.